Firstly, there are 9 new managers in the 10 this season and I’m delighted to say that one of them is our own FFGeek contributor Keith Spencer. You can find Keith on twitter here by the way. Keith’s last 3 years history are 17/18 (3,940), 16/17 ( 325) and 15/16 (9,280). We’ve also added Paul Williams to the FFGeek team who is also part of the 10 top managers. His history is 17/18 (412), 16/17 ( 1,382) and 15/16 (7,164). These managers are unbelievable and every bit as impressive as last season. 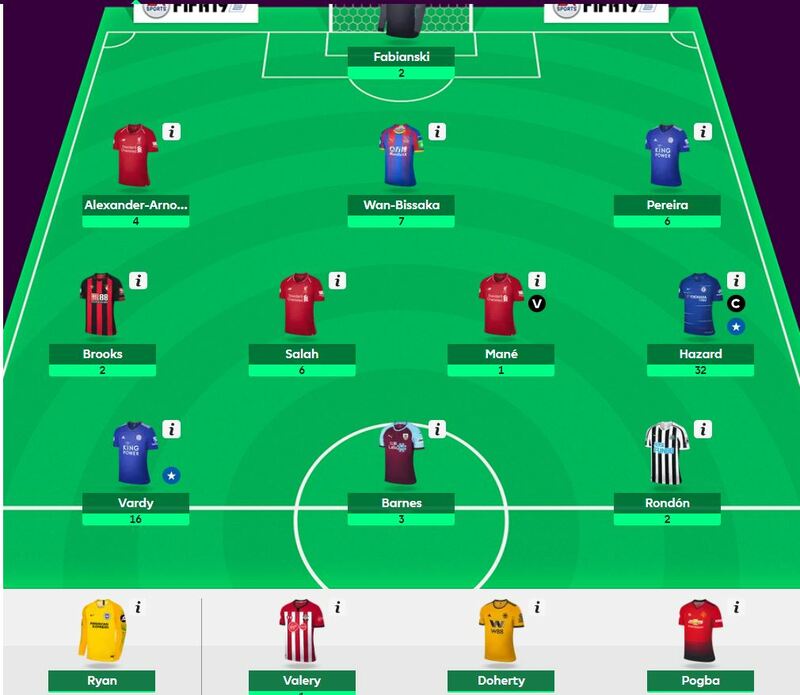 A good week for the 10 FPL managers. 9 of the 10 had a green arrow. The average score of the 10 FPL managers in GW33 was 69 taking into account point deductions for extra transfers. That’s 33 points and 92% higher than the game average of 36. High score of the 10 was 81. The low score was 58. 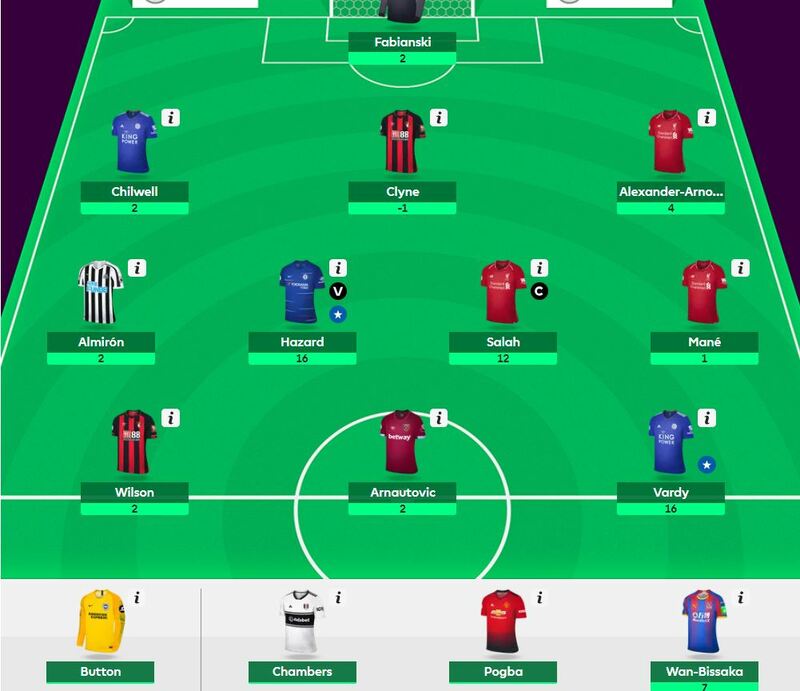 A high spread of 23 for a low scoring gameweek. The average overall rank of the top 10 FPL managers is 37k, an improvement of rank from last week of 13k. The best overall rank is in the top 500 and the lowest 118k. The top 10 Managers got some ground on the top 10k who’s average was 36 compared to the 10 FPL managers of 69. 46% of the top 10k overall rank captained Hazard, 23% Salah, 13% Mane and 12% Vardy according to FPL discovery. The FFGeek poll was 39% Hazard, 21% Vardy, 18% Salah and 14% Mane. 4 have used their triple captain chip. 2 managers have used their 2nd wildcard. His score was 81. He’s the last of the 10 managers with an 118k OR. His last 3 seasons are 5k, 2k and 4k OR. His score was 58. He’s currently ranked 17k. His last 3 seasons are 2k, 4k and 2k. Next week will be a wildcard special when I expect 8 managers to have used their wildcard. It will be more in line with the normal format.